// created at different times, but share the same environment index. // All real environments are greater than 0 (so the sign bit is zero). // stands for the current environment. Modify mem_init() in kern/pmap.c to allocate and map the envs array. This array consists of exactly NENV instances of the Env structure allocated much like how you allocated the pages array. Also like the pages array, the memory backing envsshould also be mapped user read-only at UENVS (defined in inc/memlayout.h) so user processes can read from this array. You should run your code and make sure check_kern_pgdir() succeeds. Initialize all of the Env structures in the envs array and add them to the env_free_list. Also calls env_init_percpu, which configures the segmentation hardware with separate segments for privilege level 0 (kernel) and privilege level 3 (user). Allocate a page directory for a new environment and initialize the kernel portion of the new environment’s address space. You will need to parse an ELF binary image, much like the boot loader already does, and load its contents into the user address space of a new environment. Allocate an environment with env_alloc and call load_icode to load an ELF binary into it. Start a given environment running in user mode. will panic with the message “env_alloc: out of memory”. // and insert them into the env_free_list. // LAB 3: Your code here. // Initialize the kernel virtual memory layout for environment e.
// and initialize the kernel portion of the new environment's address space. // of the environment's virtual address space. // -E_NO_MEM if page directory or table could not be allocated. // Now, set e->env_pgdir and initialize the page directory. // (except at UVPT, which we've set below). // See inc/memlayout.h for permissions and layout. // Can you use kern_pgdir as a template? Hint: Yes. // - The initial VA below UTOP is empty. // - You do not need to make any more calls to page_alloc. // pp_ref for env_free to work correctly. // - The functions in kern/pmap.h are handy. // UVPT maps the env's own page table read-only. // and map it at virtual address va in the environment's address space. // Does not zero or otherwise initialize the mapped pages in any way. // Pages should be writable by user and kernel. // Panic if any allocation attempt fails. // 'va' and 'len' values that are not page-aligned. // You should round va down, and round (va + len) up. // for a user process. // before running the first user-mode environment. // virtual addresses indicated in the ELF program header. // but not actually present in the ELF file - i.e., the program's bss section. // boot/main.c to get ideas. // Finally, this function maps one page for the program's initial stack. // load_icode panics if it encounters problems. // - How might load_icode fail? What might be wrong with the given input? // at the address specified in the ELF segment header. // You should only load segments with ph->p_type == ELF_PROG_LOAD. // and its size in memory can be found in ph->p_memsz. // ph->p_va. Any remaining memory bytes should be cleared to zero. // Use functions from the previous lab to allocate and map pages. // question: how to copy memory? for-loop and assgin? // All page protection bits should be user read/write for now. // the same virtual page. // You may find a function like region_alloc useful. // Q: how to use region_alloc? // directly into the virtual addresses stored in the ELF binary. // to make sure that the environment starts executing there. // ph->ptype should be 1 instead of 0 . // at virtual address USTACKTOP - PGSIZE. Ex 1. In the file kern/pmap.c, you must implement code for the following functions (probably in the order given). ; then write each argument directly, see below. ; add esp, 12 ; remove arguments from frame, ebp - esp = 12.
; and variable length arrays allocated on the stack. ; i.e. it's preserved after calling the callee. ; it therefore still points to the start of our stack frame. At ebp is a pointer to ebp for the previous frame (this is why push ebp; mov ebp, esp is such a common way to start a function). This effectively creates a linked list of base pointers. This linked list makes it very easy to trace backwards up the stack. For example if foo() calls bar() and bar() calls baz() and you’re debugging baz() you can easily find the parameters and local variables for foo() and bar(). 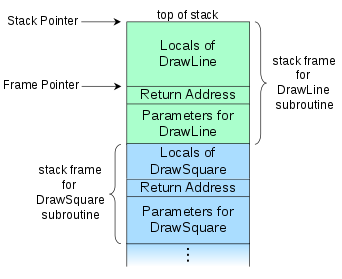 What is exactly the base pointer and stack pointer? To what do they point? * redistribute, and modify it as specified in the file "COPYING". * Kernel C code entry point. * and spawns init process. 105 # as the target C compiler. 108 # Target linker. GNU ld is probably to only one that will work. 00000000000p[ ] >>PANIC<< .bochsrc:4: vgaromimage directive malformed. # An example .bochsrc file. # You will need to edit these lines to reflect your system. # useful for debugging the kernel.